The HBO series is doing what the books that form its source material could never do: come to an end, says Zack Handlen. "Game Of Thrones isn’t just telling the rest of Martin’s story before he can finish it himself; the show is doing it better than he could," says Handlen. "Whether or not that proves to be true, most of the apparent changes are things that were inherent in the text from the start." Handlen says the TV series and Martin's book series can only end in one of two ways: Either The White Walkers win or the humans win. But it's hard to imagine the White Walkers winning after all these years focused on the humans. 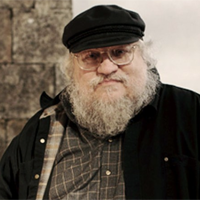 "Really, Game Of Thrones hasn’t ruined A Song Of Ice And Fire so much as it has brought the series to its inevitable conclusion," says Handlen. "It remains to be seen if that conclusion will make everyone happy or not (spoiler: probably not), but regardless, it will be an ending. If Martin ever finishes books six and seven, it will be in a world that has largely moved on from that version of his tale. And while that seems a bit sad, it might also be for the best for the writer. If the reason Martin has been struggling so long to finish his work is because of his concerns over living up to expectations, it’s possible that being rid of those expectations might allow him the creative freedom he needs to see things through. It might also rob him of whatever impetus to finish he has left. Only time will tell. Fans will at least get an ending, even if it’s not necessarily the ending they wanted. Given how things so often go in the Seven Kingdoms, that’s not entirely inappropriate." Is it possible to binge through 67 Game of Thrones episodes in the three weeks before the season premiere?